In FY18, 74 payloads delivered to the ISS National Lab carried multiple projects and investigations across diverse sectors. More than 70% of launched payloads represented investigations from the private sector and included projects from Fortune 500 companies, innovative startups, and leading media organizations. 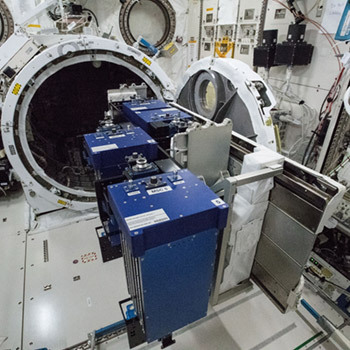 Two new commercially operated facilities were installed on the ISS National Lab. The ISS National Lab strives to maximize utilization and science return, generating value and positive impact for the U.S. taxpayer. Private-sector utilization of the ISS National Lab was robust in FY18, representing 70% of payloads and including expansion of commercially operated facilities, illustrating demand and supply within the developing LEO economy. 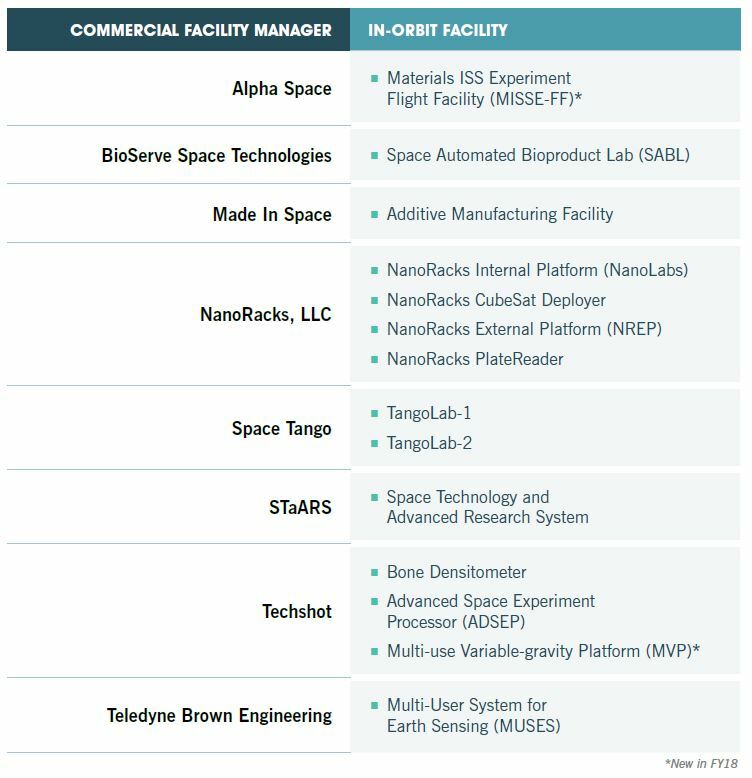 In-orbit commercial facility managers provide users with operational capabilities, experience, and engineering expertise to address unique research needs and are pioneering best practices for the future LEO marketplace. Five FY18 launch vehicles delivered 74 payloads to the ISS National Lab, many of which contained multiple projects. Below are selected highlights. National Geographic installed a camera on the ISS to film educational content for their 10-episode television series “One Strange Rock,” which was the network’s fourth most watched series globally with 81 million viewers. View the series at http://issnl.us/ar1803. Spire Global deployed the NanoRacks-LEMUR-2 satellites, part of a remote-sensing satellite constellation capable of providing global ship tracking and weather monitoring for the approximately 90% of global trade that is shipped by sea. Read more at http://issnl.us/ar1804. Angiex, a startup company awarded in collaboration with Boeing through the MassChallenge program (see Research Competitions), is evaluating a novel cancer therapy that targets tumor vascularization. Read more at http://issnl.us/ar1805. Researchers at the University of California, Santa Barbara seek to improve ocean-based oil and gas exploration, leading to commercial and environmental benefits. Read more at http://issnl.us/ar1806. Researchers at the University of Florida are studying algae in space toward possible bioproduction of new pharmaceuticals and health-related products. Read more at http://issnl.us/ar1807. The University of Wisconsin–Madison sponsored student crystal growth experiments on the ISS as part of an educational competition to promote science literacy. Read more at http://issnl.us/ar1808 and http://issnl.us/ar1809. 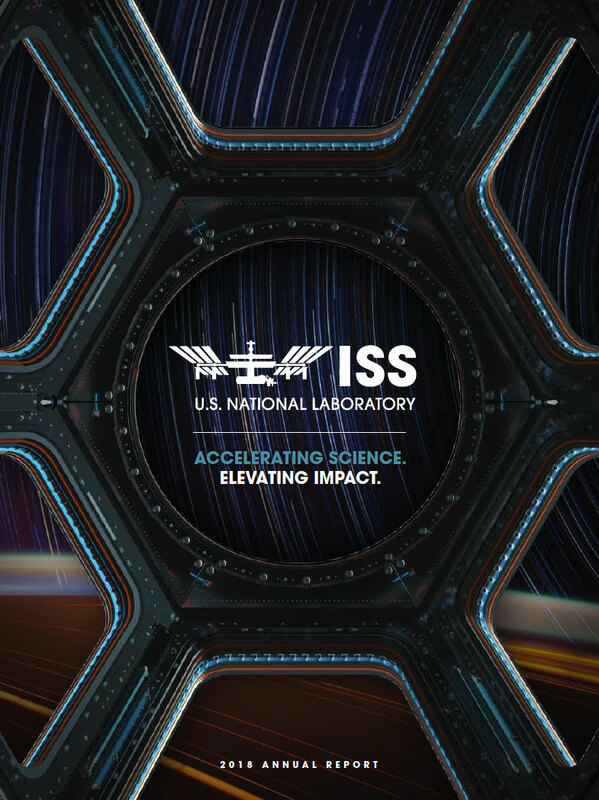 For a full listing of the ISS National Lab portfolio, including flight status of projects delivered this year, see http://issnl.us/ar1810. 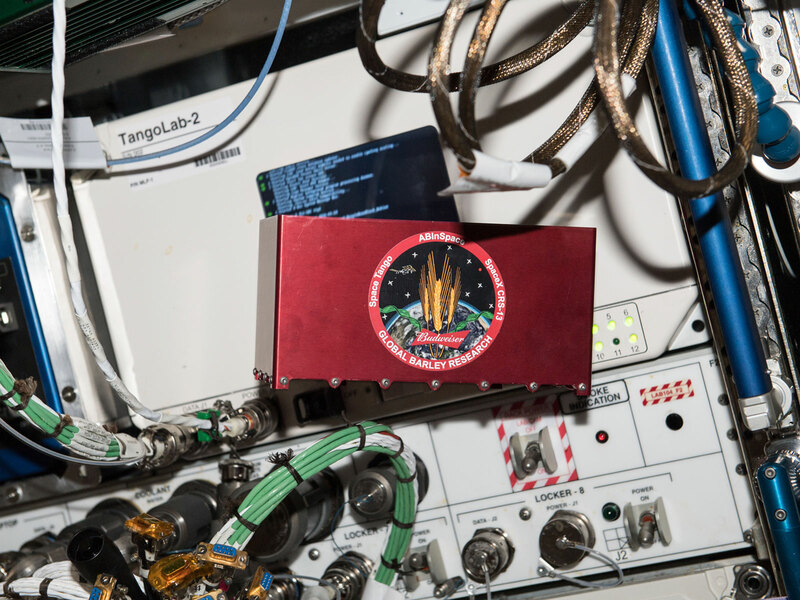 Media Credit: Image courtesy of Techshot, Inc.
that can control temperature within experiment modules to support in-orbit control experiments by providing artificial gravity. The MVP is designed to collect and share data in near real-time from experiments in many fields, including those studying cells, protein crystals, and small model organisms such as fruit flies. For more information, see http://issnl.us/ar1811 and http://issnl.us/ar1812. 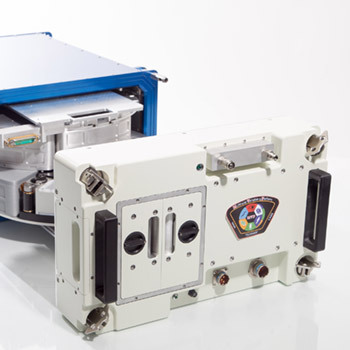 The AlphaSpace MISSE-FF is prepared to be installed to its external location on the ISS. manager Alpha Space Test and Research Alliance, LLC under a Cooperative Agreement with NASA, is a materials-science and component-testing platform on the outside of the ISS, providing data collection capabilities for passive and active material samples as well as other experiments requiring exposure to the extreme environment of space. For more information, see http://issnl.us/ar1813 and http://issnl.us/ar1814. The Multi-User System for Earth Sensing (MUSES) from Teledyne Brown Engineering installed its first instrument, the DLR (German Space Agency) Earth Sensing Spectrometer (DESIS). The MUSES platform coupled with DESIS will assist in the advancement of Earth imaging, mapping, disaster recovery, and agricultural assessments. The NanoRacks External Platform (NREP) initiated the commercial platform’s third customer mission. NanoRacks announced that Thales Alenia Space was selected as the latest partner in its commercial airlock program (joining Boeing and ATA Engineering). The first privately funded commercial airlock, “Bishop,” is scheduled to become operational in 2020 and will increase capabilities in both R&D and ISS operations. 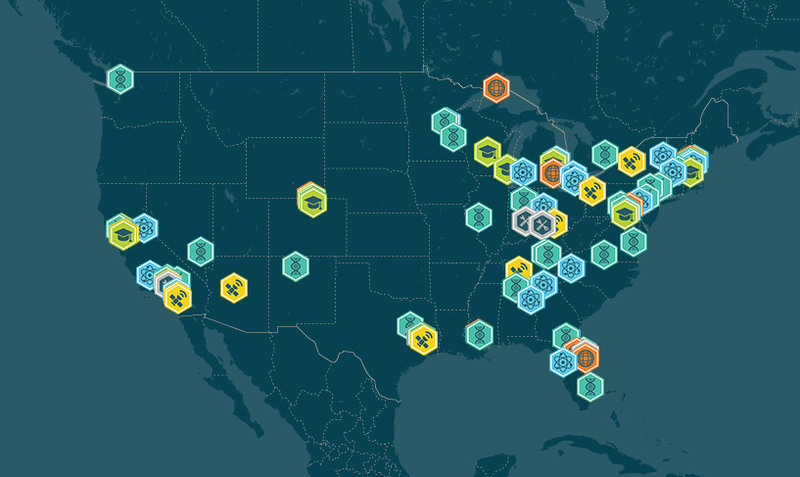 Additionally, dozens of innovative commercial Implementation Partners support the growing demand for space-based research by providing support services on the ground (see ISS National Lab Implementation Partners list below), playing a critical role in the success of the ISS National Lab R&D community. Collectively, these projects, programs, and service providers contribute to growth of the LEO economy by translating use of the ISS National Lab into downstream value to benefit life on Earth. In addition to the anecdotes and advancements discussed above, quantitative assessments of value (based on self-reported data from our investigators and review by external subject matter experts) indicate potential future incremental revenue from the ISS National Lab portfolio will exceed $900 million from estimated addressable markets totaling more than $100 billion. 14 commercially operated facilities are onboard the ISS National Lab, managed by 8 companies. 45 Implementation Partners provide commercial services to ISS National Lab users.